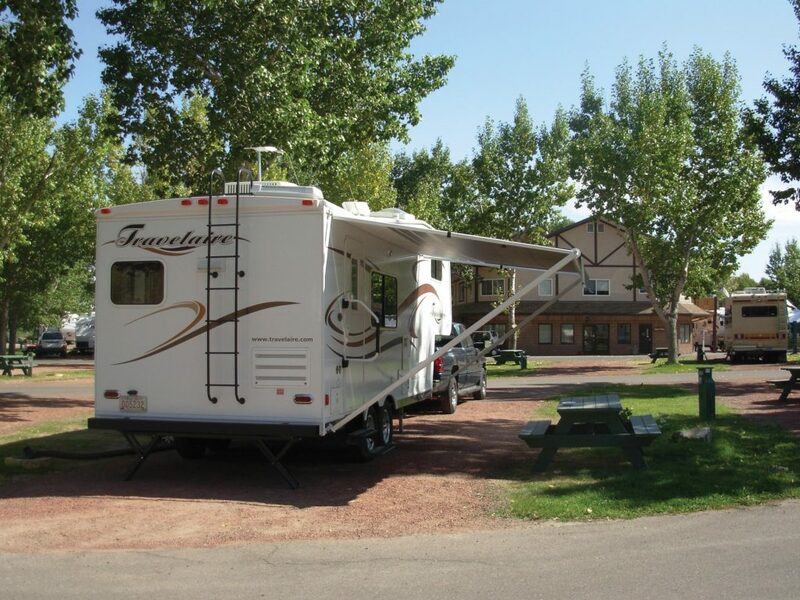 Travelaire Canada, one of our country’s leading manufacturers, has been building recreational vehicles for over 45 years. 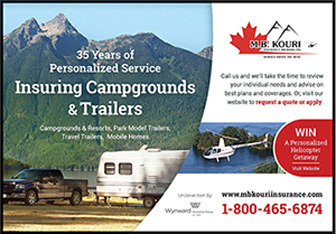 Originally founded in Edmonton in 1963, they moved south 150 km to Red Deer, Alberta, in 1966, where they continue to streamline their manufacturing processes on an on-going basis. 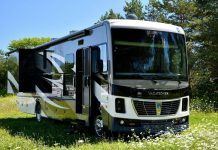 Their current line includes a broad spectrum of travel trailers, fifth wheels and C-class motorhomes offered through their five major, well-known brand names: Travelaire, Genesis, Rustler, Roughneck and Aerolite. 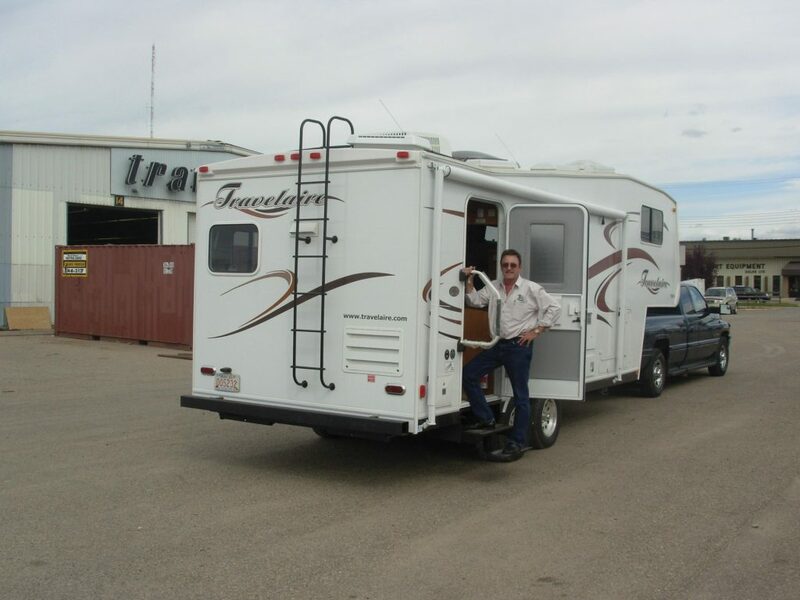 Eagerly anticipating our trip to Southern Alberta, we picked up our test unit, a Travelaire TW246 hard-wall constructed fifth wheel, at the factory. After we hitched up, our journey took us south from Red Deer on the busy QE2 freeway, which has a posted speed limit of 110 km per hour. Our 3/4 ton Dodge D250 pickup with 5.9 liter gas engine had no problem maintaining the posted speed or handling the load, which has a dry weight of 6557 lbs. (2974 kg), but was closer to 7200 pounds (3266 kg) fully loaded. We decided to bypass the busy city streets of Calgary and detoured east at Airdrie, almost to Strathmore, then south to our destination, the Lethbridge river valley. 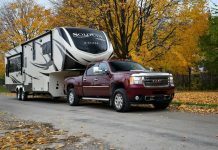 While we regularly travel in, and tow, a variety of RV units, the stability and ease of handling fifth wheel travel trailers almost always provides a stress-free towing experience. Our Travelaire TW246, which measured almost 26 feet, tip to tail, was no exception to this rule. 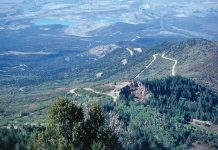 It tracked beautifully and despite the fact that we traveled on secondary highways, the ride was particularly smooth thanks in large part to the four shocks that are mounted on the Standen’s tandem-axle running gear that our unit was equipped with. 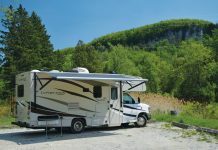 As a result of our late afternoon departure, which was complicated by a few sightseeing excursions along the way, we arrived at our destination, Bridgeview RV Park after darkness had set in. Thankfully, the park was easy to find, and our assigned site was a drive-through. Our rig was equipped with ample exterior lighting, including a hitch and roadside service light which made unhitching and setup much easier in the dark. 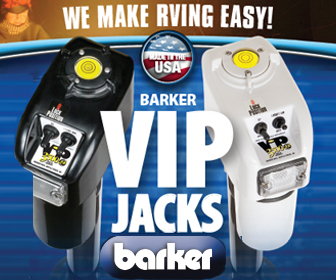 Our unit was outfitted with optional electric telescoping front jacks and manual-crank stabilizing jacks on the rear. Setting-up was quick and convenient, and the seven-foot cable-driven slide-out operated very smoothly. The dual 30-pound propane tanks, complete with an automatic changeover regulator, were easily accessible in a rear compartment. In no time at all, we fired up the appliances and settled in for a relaxing, restful evening following a long afternoon of travel. 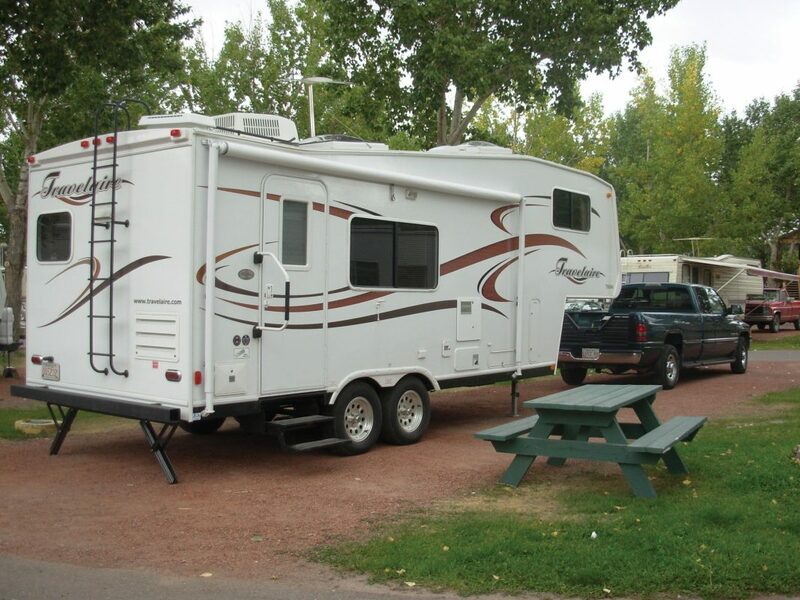 Our unit was equipped with an optional exterior audio sound system, outside shower, park cable hookup, black water tank flusher and a roof rack with ladder. Other features included: radius corner tinted windows, a folding grab handle at the entrance door, aerodynamic fiberglass front nose cap, LED tail & clearance lights and insulated storage doors with easy-open pull tabs. There are several exterior storage compartments, but the primary storage space is located at the front, under the gooseneck and contains two group 27 batteries, which are factory pre-wired for the addition of solar panels. To preserve battery power, there is a disconnect switch conveniently located inside one of the adjacent compartments. For outdoor cooking enthusiasts, there is even a barbecue connection with a quick-connect hookup. The TW246 model contains an enormous amount of grey water storage, 73 U.S gallons, which is split between two separate tanks. 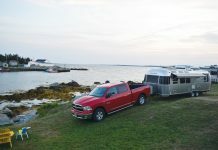 As a result, our rig had two drain outlets – the bathroom’s grey tank that is shared with the black tank, located near the front and left side, and a second outlet for the kitchen’s grey tank was located near the rear on the same side. While the convenience of additional storage is most welcome, we found it was rather awkward to have two separate drain hookups, particularly when they are located so far apart. This seems to be a very common practice for many manufacturers in recent years. The TW246 model features a very spacious rear kitchen design, which is not only extremely functional but very tastefully decorated. Attention to detail is apparent throughout, from the decorative vinyl wall panels to the rich oak wood finishes and elegant flooring. The galley, living and bathroom areas utilize durable vinyl flooring while the upper bedroom area is equipped with plush carpeting that provides a warm, comfortable ambiance. Venetian blinds cover the windows in the kitchen and living space and the sleeping area incorporates roll-down blinds to provide maximum protection form light infiltration… for those of us that like to sleep late from time to time. The only slide-out is located on the left side, just forward of the rear galley. 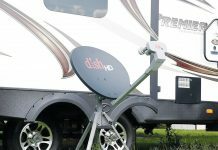 It is relatively small, 7-feet long, and while only projecting out 14 inches, it opens up plenty of functional extra space. The large sofa bed, which is mounted on the slide-out, contains built-in drink holders on each armrest and unfolds into a decent sized 76” by 43” wide sleeping area. 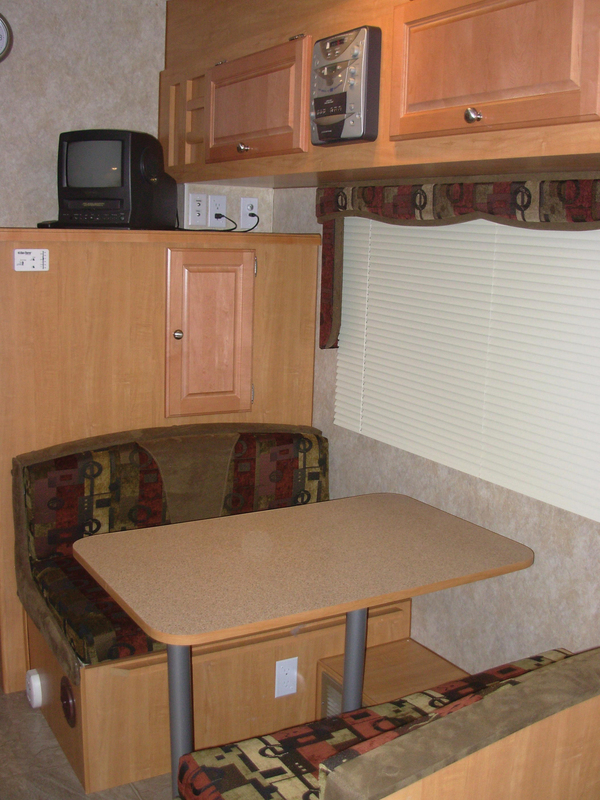 The dinette is located directly across from the sofa bed and features a large table, 38” x 24”, that seats four adults and folds into a 41” x 67” bed that could easily handle two children. This layout creates a comfortable, spacious environment for entertaining or relaxing after a busy day of outdoor activities. In addition to the abundant natural lighting provided by the many windows, the living area captures even more natural light through its large 30” by 30” skylight, which is complete with a retractable blind and nicely trimmed with oak moldings. For entertainment, a CD/DVD/radio combination is mounted above the dinette, and we truly enjoyed the incredible sound quality this unit delivers. Both the living space and the bedroom are outfitted with television mounting platforms and a crank-up Winegard antenna, c/w booster, is provided for local television programming. 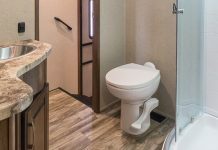 To combat chilly nights, the furnace pumps up to 31,000 BTU of heat, and this fifth wheel even has a floor heat duct in the upper sleeping area. The optional air conditioner, equipped with a heat strip, distributes heat or cool air evenly throughout the living space via ceiling ducts. The entire heating & cooling system is controlled with an easy-to-use electronic comfort control centre. For safety, our unit was equipped with an LP Gas alarm and smoke detector. To help keep the floors clean and conceal clutter, there is a convenient shoe storage cupboard located under the refrigerator and is located directly beside the rear entrance door. The bathroom is truly a marvel of functional design technology. It incorporates a separate room for the tub/shower, with water-tight tub surround and a single-pedal, foot-flush Sealand china toilet. This space has a powered roof vent to provide ventilation and a large 13” X 22” skylight, over the tub, which saturates the compact space with natural daylight. 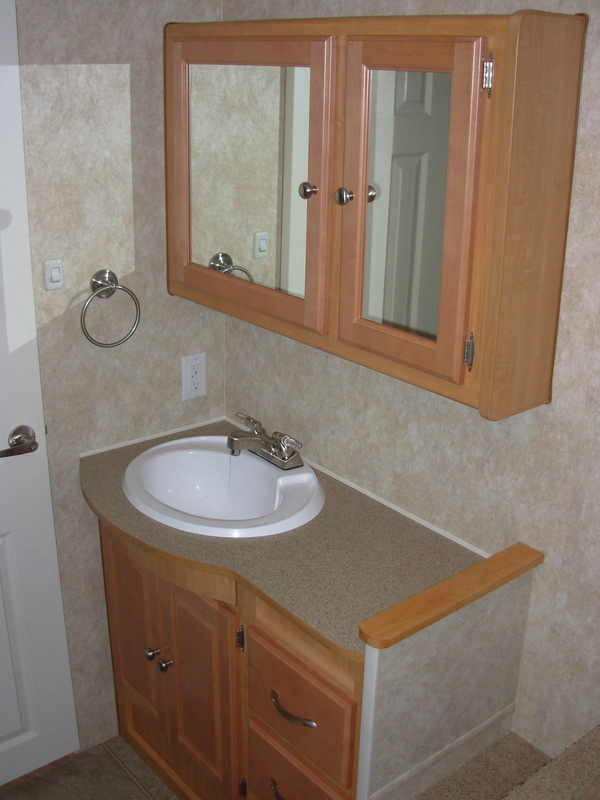 The washing / grooming area is extremely well-designed and contains lots of elbow room, with plenty of counter space alongside the sink. 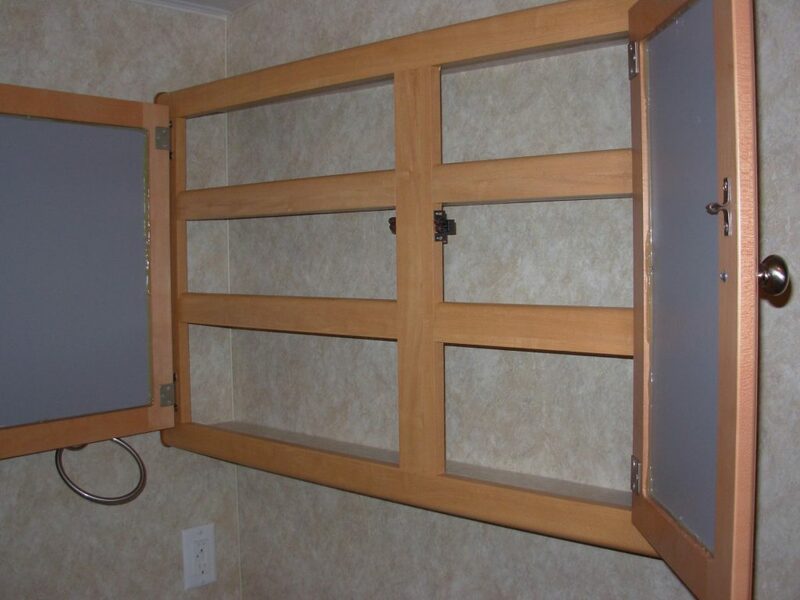 The large mirrored medicine cabinet is 39 inches wide, and incorporates three huge, well-designed shelves that provide an enormous amount of interior storage space and are even equipped with wooden trim that prevents items from falling out. 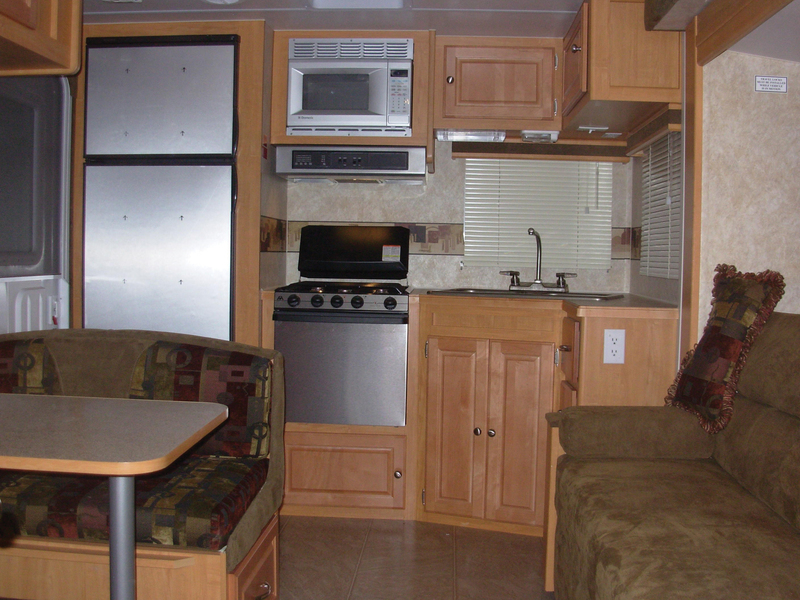 In addition, you will never run out of hot water since this RV is equipped with a 10-gallon, DSI LP gas/electric water heater. The bedroom provides a hefty 55 inches of height and features a large raised bed with a comfy 60” by 74” spring-filled mattress and is complemented with coordinated bedspread, pillows and décor toss cushions. The bed is further enhanced by a unique combination headboard/adjustable folding backrest that eliminates the need for multiple pillows to prop yourself up for reading or watching television. For night time convenience, there is a large shelving unit, with a cutout that doubles as a night table, on one side of the bed and a stand alone night table on the other side. 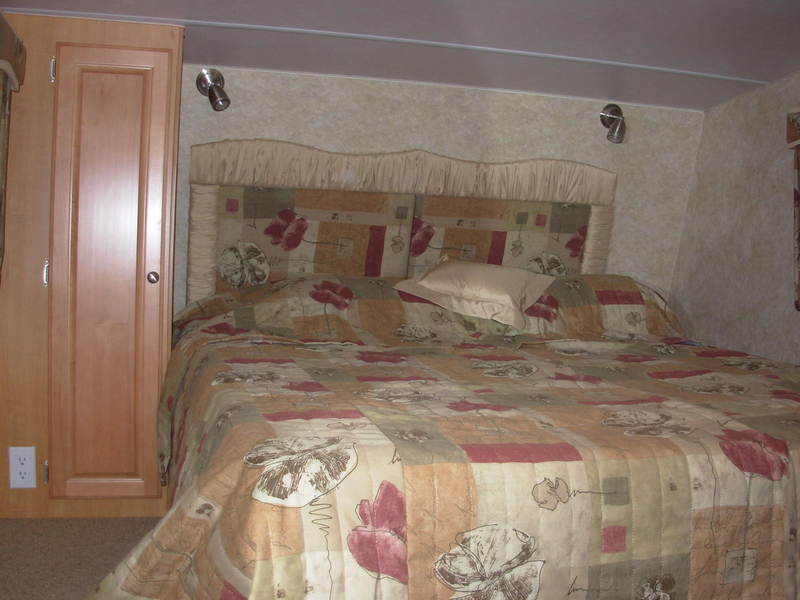 The entire sleeping area can be closed off by a privacy drape and our unit was equipped with an optional powered fantastic roof vent for additional ventilation in the sleeping area. 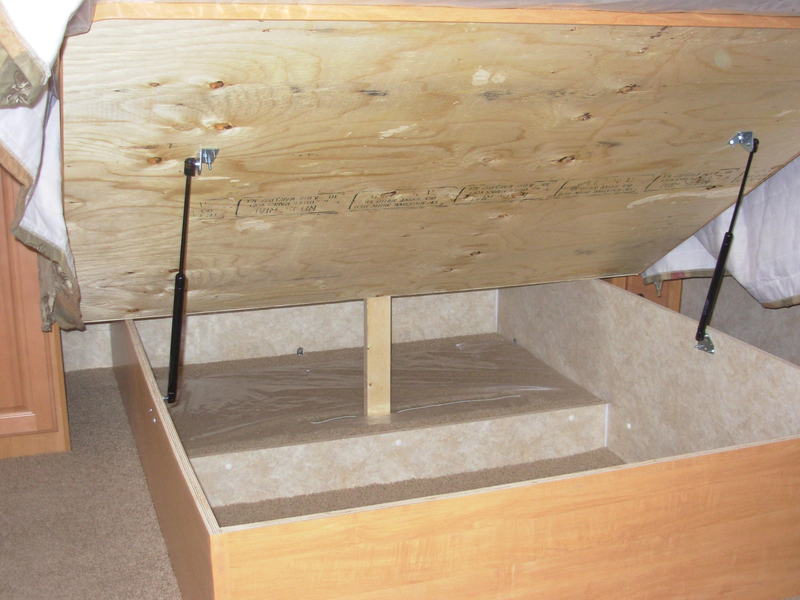 Last, but not least, is the massive amount of storage space located under the bed. It provides easy access with lift-up gas shocks and offers wide-open storage that measures 66” by 48” by 18” high. The kitchen area of the Travelaire contains a very functional, fully-equipped work space well suited for meal preparation. The 6-cubic foot, double-door stainless refrigerator is located right beside the entrance door which makes it very convenient to access from either inside or outside. It is truly amazing how much cleaner the floors stay when the refrigerator is so easily accessible from outside! The 3-burner range, complete with oven, is finished with a stainless front and black top that is complimented with a fold-down stove cover to help protect the stove’s surface and it doubles as additional work space when the stove-top is not in use. To exhaust cooking odours, the range is equipped with a matching powered hood that also houses the built-in monitor panel. 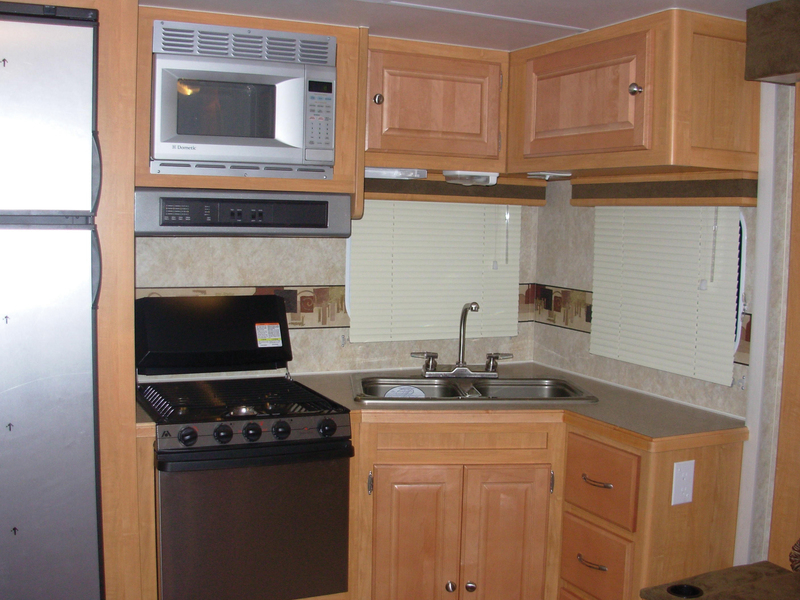 For cooking convenience, our unit was equipped with an optional eye-level microwave oven, finished in stainless to match the other appliances. The double fiberglass sink, complete with covers and high-rise faucet, is slightly angled to provide maximum access and convenience. Barry Bateman, President of Travelaire, took us on a factory tour and explained their manufacturing philosophies. Their prime focus is to treat every unit that’s built as if it is someone’s home, using the highest quality materials and processes while adhering to strict quality control standards that are among the best in the Industry. “Our construction processes provide sturdy, durable products that are well known to withstand the test of time,” Bateman proudly announced. The Travelaire roof is built using a five-inch crowned truss system that is curved to enhance water runoff, complete with a residential style vapour barrier. 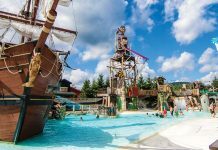 It is finished with 3/8″ fir plywood decking and a one-piece Brite-Ply EPDM rubber roof membrane. The floor is constructed with 5/8″ fir tongue & groove plywood that is glued and screwed to the floor joists on sixteen-inch centers for superior strength. Both the floor and the roof carry 7-year limited warranties. The cabinets are constructed with solid frame maple mortise and tenon cabinet doors. The perimeter framing used for overhead cabinets is made with lumbercore that is double-drilled and double-screwed to provide maximum strength and durability. The counters, table tops, and drawers are built from plywood (no particle board is used anywhere) and all the horizontal surfaces are finished with a quality scratch resistant laminate. We scrutinized every nook and cranny throughout the interior and exterior of our TW246. 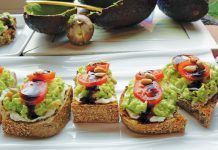 While every serious critic will always find some nitpicky items, we were hard-pressed to find anything worthy of mention. 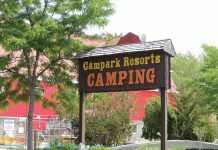 We are most thankful for the glorious hospitality that was provided by the hosts at Bridgeview RV Park and all the places we visited. 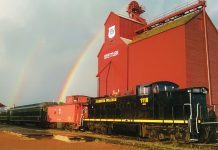 All in all, we had a marvelous time exploring Lethbridge, Southern Alberta’s “Garden City” and a special thanks to the staff at Travelaire for providing our test unit. Propane gas capacity – 2 X 30 lbs. 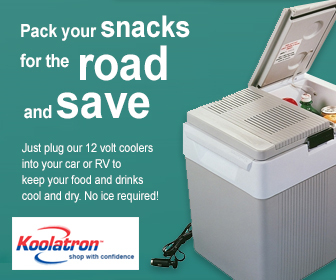 For more information on the Travelaire models for 2008, please visit your local RV Dealer or view the trailers on-line at www.travelaire.com. 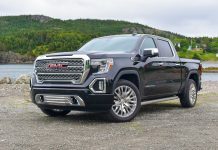 Previous articleHow I Convinced My Wife She Didn’t Need an SUV.